Equip yourself to safely administer more than 400 intravenous drugs with the #1 IV drug handbook on the market! 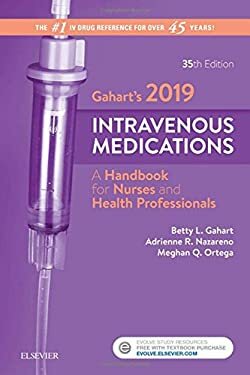 Now in its 35th edition, Gahart's 2019 Intravenous Medications: A Handbook for Nurses and Health Professionals continues to be the most proven resource for comprehensive drug coverage, unparalleled accuracy, and an intuitive quick-access format. In addition to updating drug interactions, precautions, alerts, and patient teaching instructions for all existing IV drugs, this new 35th edition includes over a dozen new monographs of the most recent IV drugs to be approved by the FDA. When being inaccurate or out-of-date is not an option, Gahart's annual publication and 40-year history of impeccable accuracy offers the confidence and proven guidance you need to safely and effectively administer any IV drug available today. Annual publication prevents users from referencing outdated information. 40-year history of impeccable accuracy reinforces the importance of safe IV drug administration. Monographs on more than 400 IV drugs offers an impressive breadth of coverage that goes well beyond any comparable drug reference. The perfect depth of information contains everything that is needed by today's clinicians for safe administration of IV drugs - nothing less, nothing more. Proven, clinically-optimized page layout keeps all dosage information for each drug on either a single page or a two-page spread to prevent hand contamination by having to turn a page. Highlighted Black Box Warnings and relevant content make locating critical information fast and easy. Special circumstances in blue-screened text call attention to important circumstances that may not warrant black box warnings. Convenient, alphabetical format organizes all drug monographs by generic name, allowing users to find any drug in seconds. Dilution and dosage charts within monographs provide quick access to essential clinical information. Life stage dosage variances are highlighted for geriatric, pediatric, infant, and neonatal patients. Additional drug monographs not included in the printed guide are housed on the companion Evolve website. (Drugs found in ebook formats.) NEW! Over a dozen new drug monographs provide current, clinically relevant drug information for the most recent IV drugs to be approved by the FDA. NEW! Updates on drug interactions, precautions, alerts, and more have been made throughout the guide to reflect all changes to existing medications.